Children love competition. Board games give them the chance to learn to win or lose (with grace, we hope!). When children play board games, they are strengthening their mathematical, vocabulary, thinking, memory skills – and that’s just the beginning. By rolling the dice and moving their player on the board, children gain greater numerical understanding. Moving five spaces helps a child master counting and addition. Candy Land can be played by children as young as three, and it is often the first game little children learn to play. Instead of rolling dice, they draw colored cards and move their game piece by matching colors along the colored candy path. Games like Clue help kids build deductive reasoning skills. Cranium Cariboo teaches letters, numbers, shapes, and colors. Games show children how to follow rules, take turns, devise strategy and exercise fine-motor control while moving their game piece around the board. Some of my favorite games for kids are Candy Land, Connect Four (great for building thinking and fine motor skills), Hiss (wonderful for building patterning abilities), and Chess. These days, children as young as three are learning to play Chess! Playing Chess builds critical thinking, spatial skills, numerical abilities, problem solving, memory, patience, logical thinking, pattern recognition skills, and more. Children who play Chess score higher on standardized reading and math tests, which is why it is required curricula in thirty countries. If you think your child may enjoy Chess, give it a try. If you happen to live in NYC, I recommend checking out the folks at Chess at Three. 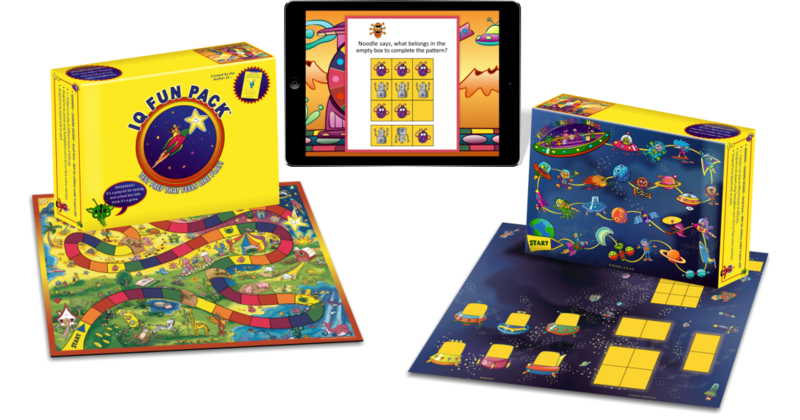 If you are looking for a board game to build all the skills kids need for kindergarten readiness, I recommend IQ Fun Pack, which has over 25-games-in-1 and three different game boards! Disclaimer here – I invented the game myself and it is designed to prepare children ages 3 – 6 for tests and kindergarten! CLICK HERE to learn more about it.